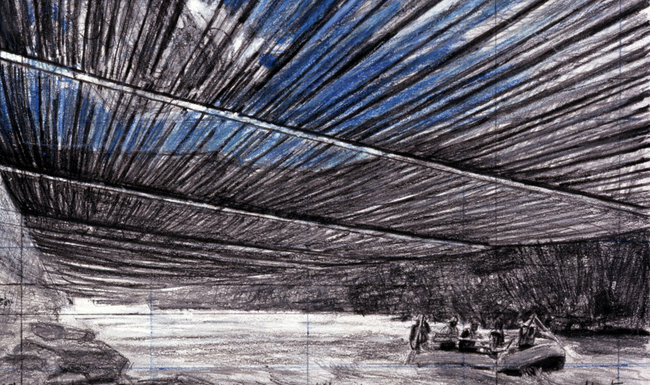 A drawing by Christo that shows how the suspended panels will look from river level. Back in September, we posted about a proposed art installation that would suspend translucent fabric panels above almost 6 miles of Colorado’s Arkansas River in Bighorn Sheep Canyon. One commenter on our post had this to say: “Due to the overall stupidity of this I doubt it will be approved.” We wish he were correct. Drawing visitors to Colorado to see this work will support jobs in the tourism industry and bring attention to the tremendous outdoor recreation opportunities. “We believe that steps have been taken to mitigate the environmental effects of this one-of-a-kind project. Last May, the Colorado Wildlife Commission called for the feds to reject the proposal, but to no avail. The American Sportfishing Association has been consistently opposed and has argued that anglers will suffer from the disruption of the river. The project still needs approval from Fremont and Chaffee Counties, the Colorado Department of Transportation and the State Patrol.